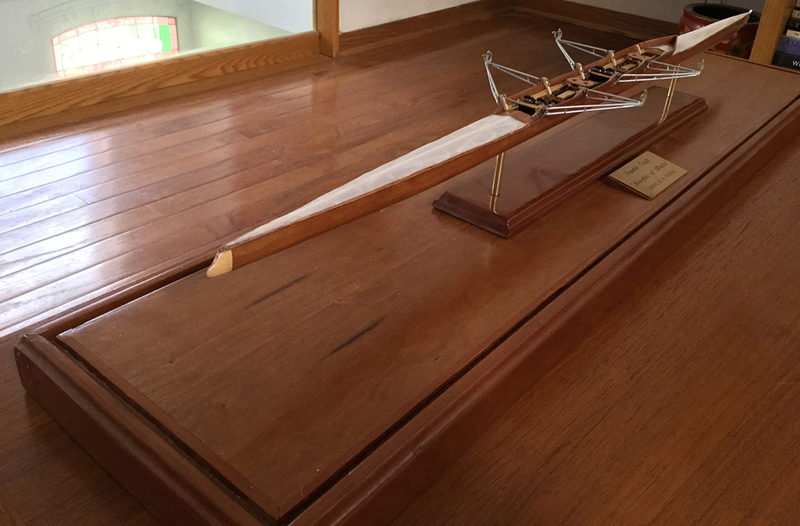 Model maker Rick Stehlik’s model of a single scull (one inch to the foot scale) was recently on display at the Philadelphia Seaport Museum. Photo: Rick Stehlik. The other week, HTBS received a few e-mails from Rick Stehlik, who is a longtime member of Malta Boat Club in Philadelphia. Rick, who is a model maker, had read rowing historian Bill Miller’s article from 23 January on HTBS about some shell models that Bill owns. 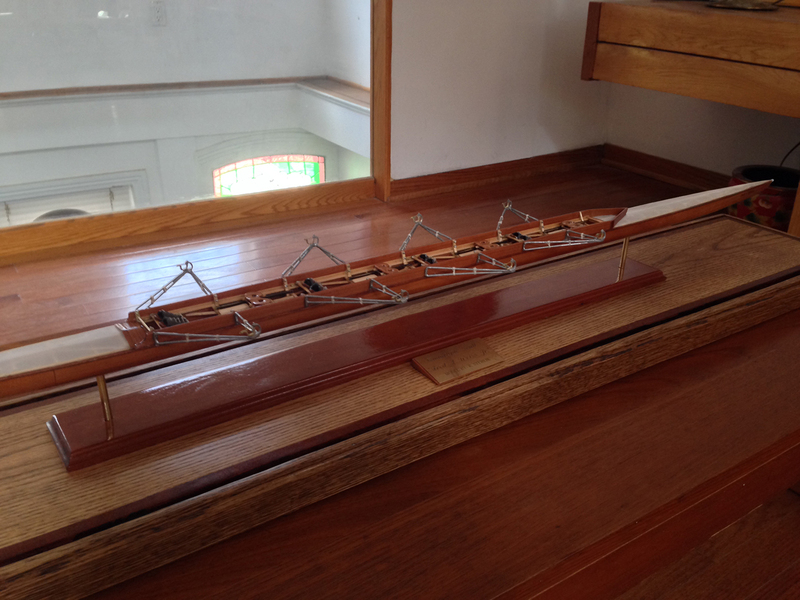 What caught Rick’s eye was the photograph of a man holding an eight model and Bill’s theory that boat builders in the 1800s and beginning of the 1900s created models of the boats they produced for individuals and clubs. [The model’s] history is a bit murky. I have been a member of the club for over 50 years. One day out of the blue, many years ago, I got a phone call at the club from a guy in California. 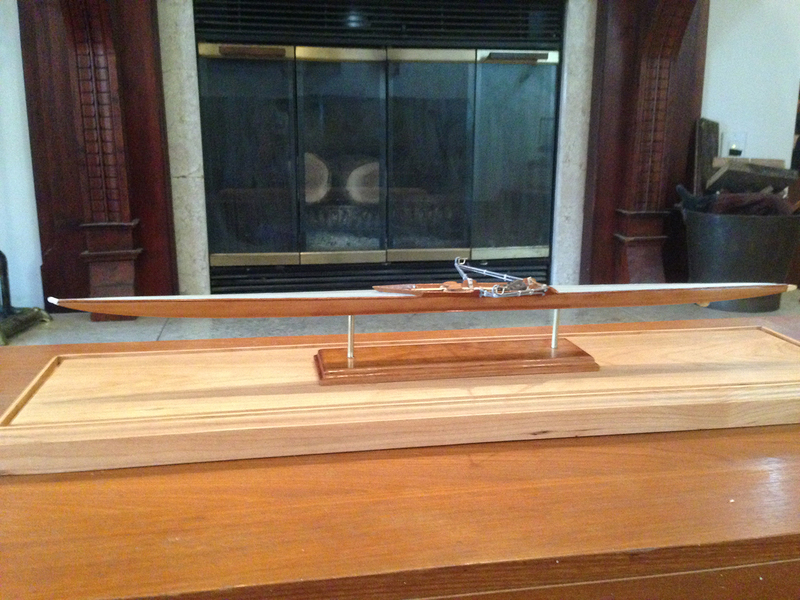 He said that he and the family were cleaning out their father’s garage and discovered this model and thought it might belong to us since it had our name on the bow. He did not identify himself, but said he would send it to us. I said sure, and soon it appeared on the club’s door step. 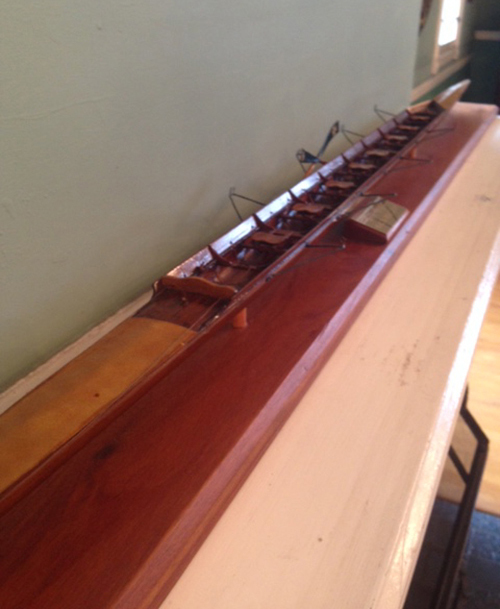 The model had no base, many of the riggers were bent, the rudder missing and only two oars of what I thought were a set of eight. 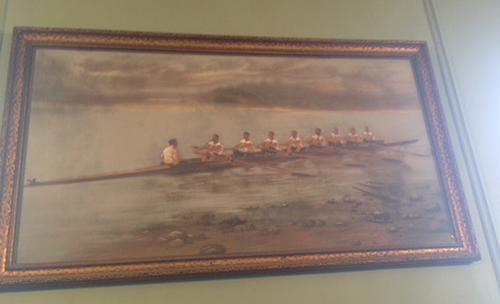 I restored it as best I could, and it is has been proudly displayed at the club ever since. We have always wondered as to its provenance and if it ever belonged to the club earlier in our history. We think it is representative on an eight shown in a painting we have hanging above the model, but do not know its exact age or who made it. The theory in Bill Miller’s article that I came across on HTBS, and the picture of the gentleman holding an eight model, does lend credence to the idea that it might have been produced by a boat manufacturer at the time. I have discovered that in Philadelphia around the turn of the 20th century there was a very busy manufacturer of shells called William Glass and Sons. We have found receipts from him in the club’s archives. 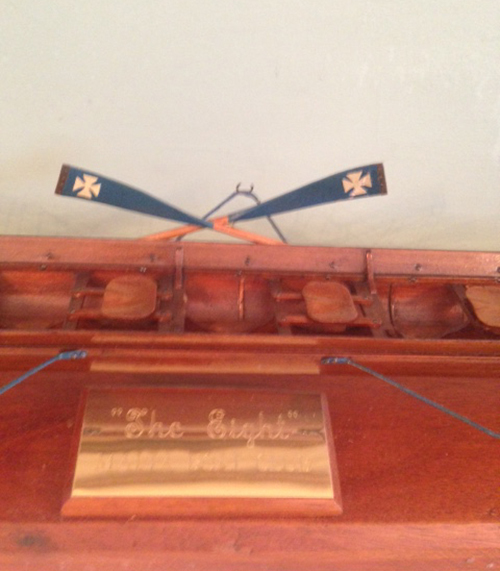 The eight model has the name Malta on the bow, so it is clear that it once belonged to Malta BC, but the members are not sure when it first appeared at the club. Photo: Rick Stehlik. ‘It’s curious that the model is a starboard rigger eight, which is shown in the painting, which apparently was the norm for many years,’ Rick writes. He would like to know if any of the HTBS readers have any knowledge of model racing shells that might give him any ideas of the lineage of his club’s eight model. 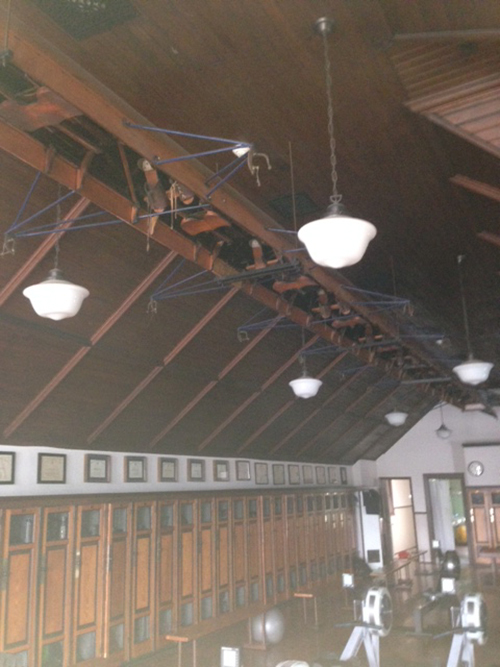 Hanging from the ceiling in the Malta BC’s third floor locker room, Rick also writes, is a wooden Octopede (sculling eight), which the club has dated to 1901. Unfortunately, there is no builder’s plaque or any other ‘manufacturer ID’. Malta BC’s Octopede. Photo: Rick Stehlik. 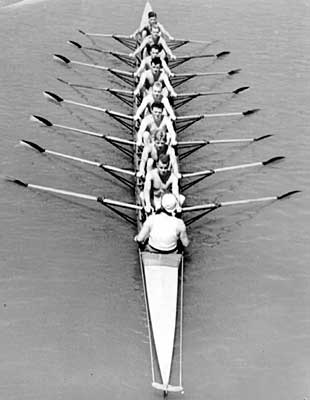 An Octopede, built by Princeton coach and rigger John Schultz in the 1930s. 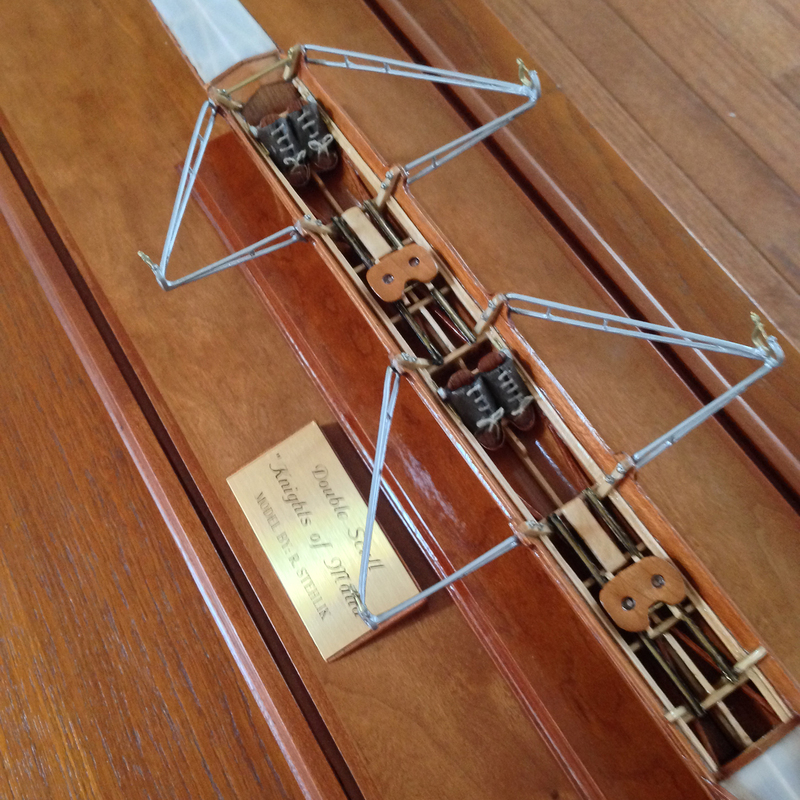 Photo: Princeton Rowing flickr. Rick Stehlik would appreciate any input from HTBS’s readers on Malta BC’s eight model or other examples of models like that. He is also interested to hear from anyone who is building racing shell models. Send your comments to HTBS via e-mail, gbuckhorn – at – gmail – dot – com and we will forward them to him. 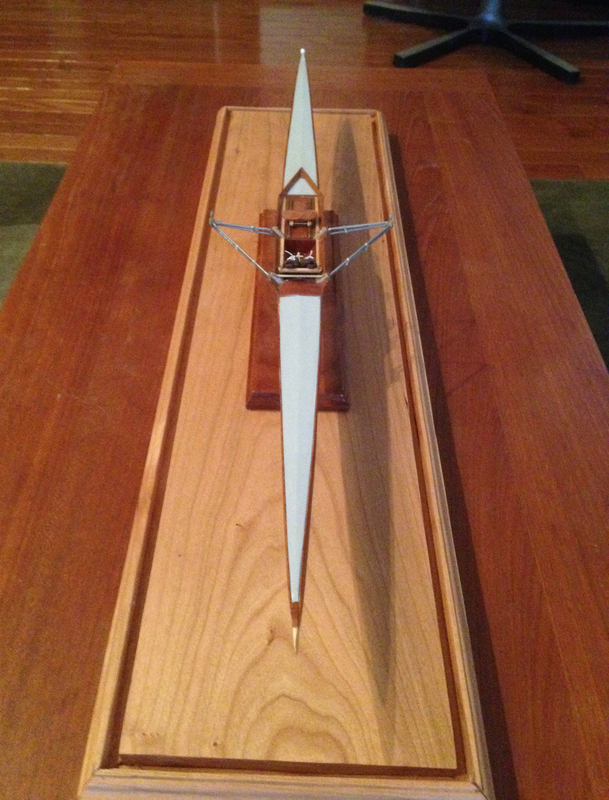 Below are some photographs of Rick’s single scull, double scull, and quad models. All his models are one inch to the foot scale. Photos by Rick Stehlik.